Review Summary: What The Fish is a disappointing case of a lost opportunity. The film is replete with chaos and unfunny squirmy sequences so it's best you stay away from it. A control-freak aunt (Dimple Kapadia) is going away for a month leaving her beloved home in her niece’s hands. The usually good Manu Rishi, Manjot Singh and Anand Tiwari go through the motions and poor Dimple Kapadia retreads one note — she cribs, screeches and hams. What the Fish is basically cinema as root canal. I suffered it so that you don’t have to. What The Fish is a disappointing case of a lost opportunity. The film is replete with chaos and unfunny squirmy sequences so it's best you stay away from it. The cavalcade of actors walk in and out the frame as well as one another's lives without leaving any impression whatsoever. Dimple Kapadia pays the price for her constant cribbing! 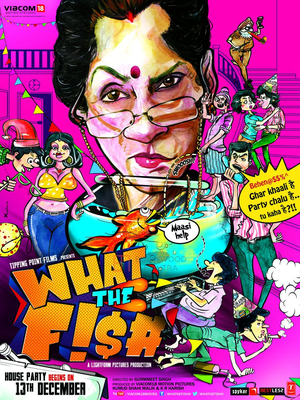 Gurmeet Singh’s “What the Fish” is a comedy about a cranky old woman, her beloved goldfish, and a group of reckless, irresponsible young people who play havoc with her house while she’s away on a holiday abroad. Overall, ‘What The Fish’ is a novel concept that goes wrong completely as the execution, starcast and a predictable story line makes this film hugely boring. Ignore this flick this weekend. But it's a desperate attempt that much like the film itself leads nowhere.